The senior Foreign Office lawyer who resigned after ministers ignored her advice that the war in Iraq was illegal has issued a damning legal critique of the occupation, claiming that the alleged abuse of prisoners “could amount to war crimes”. Lawyers are usually very precise in their use of language. Lawyers who have risen to senior positions within the British Foreign Office commonly exceed the average precision. So when Elizabeth Wilmshurst gives an interview in which she roundly attacks the current occupation of Iraq, that censure must carry some weight, even in establishment circles. Iraq is swarming with foreign invaders. Not the much-hyped legions of “Islamists” but rather the armies of the new Christian crusades, as under the aegis of Pope Dubya. All the justifications used for the slaughter and invasion are now forgotten: let’s not mention those WMDs, eh? Now the occupiers have installed their own Vichy regime, complete with an ex-CIA contact as its head. This puppet government can only bluster since it’s still the US military (and its imported civilians) which is in charge of Iraq and the alleged Iraqi government has zero control over these invaders. Does that sounds like a sovereign nation or an occupied country? 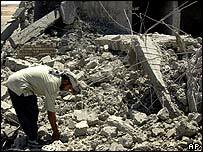 And what protection does the Iraqi people get from the crimes of their “liberators?” None. Ms Wilmshurst expressed concern about the size of the US civilian presence in Iraq. She also said she was worried about the lack of legal protection for Iraqis if they were harmed by allied troops or civilian contractors, including private security guards. She said it was “worrying” that the occupying powers had given immunity to US and British civilians which was “very, very wide” and “not what you would expect”. They would be protected from prosecution even if they seriously injured Iraqi women and children. Why grant yourself immunity from prosecution? What can your kindly troops be doing that requires this kind of blanket protection? Again, put yourself in the position of an Iraqi. A foreign army occupies your country. They say they’re here to help, to liberate you from your dictator but the first thing they do is bomb your capital flat and let lawlessness reign everwhere except for the oil-related assets. Then they demand legal exemption from any charges of harming civilians, even though it becomes publicly known they have been torturing innocent men, women and children. In fact, they’ve kidnapped children and held them without trial for over 18 months in a foreign prison called Guantanamo. Meanwhile, the US air force continues to bomb any target it pleases, justifying every attack as being on insurgent safehouses. No proof is ever provided that the people they are massacring are insurgents and not just more unlucky civilians. There have been four airstrikes since June 19th. Today, they dropped two tons of bombs on one single house. There weren’t any suspects left to question, just dismembered limbs. In Fallujah, 30 miles west of Baghdad, rescue workers picked up body parts after the U.S. airstrike, witnesses said. Video from Associated Press Television News showed the explosion flung bricks blocks away, and blood was splashed on a nearby wall. Men gathered at the 30-foot-deep pit where the house had been and pulled out clothes, including a young child’s shirt, from the rubble.